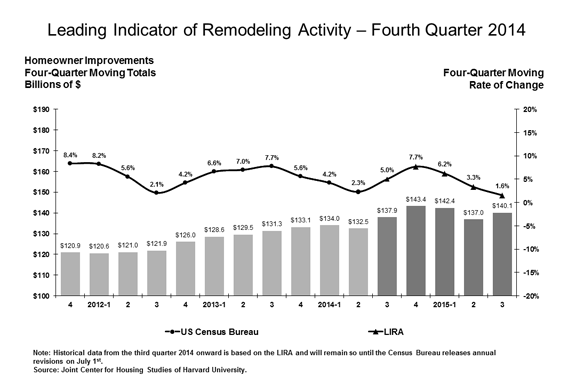 As the broader housing market continues its sluggish recovery, growth in home improvement spending is also expected to soften throughout the coming year, according to the Joint Center's most recent Leading Indicator of Remodeling Activity (LIRA) released today. 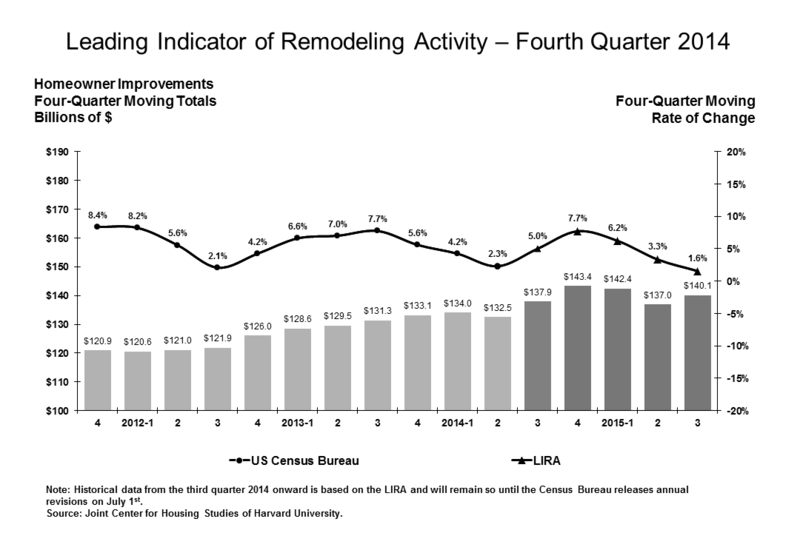 The LIRA projects annual growth in home improvement spending will decelerate from 6.3% in the first quarter of 2015 to 1.6% by the third quarter. Due in part to weakening home sales last year, growth in remodeling spending is expected to deflate somewhat in 2015. Homeownership rates continue to slide as lending remains tight and first-time homebuyers are not yet returning to the market. Although contractor sentiment has cooled in recent quarters, it remains favorable overall. House price gains are moderating but still strong and home sales appear to be turning a corner now, all of which bodes well for continued, if more moderate, home improvement gains for 2015. NOTE ON LIRA MODEL: Beginning with the first quarter 2014 release, long-term interest rates were removed from the LIRA estimation model. For more information on the reasons for and implications of this change, please read our blog post from April. On Thursday, January 29, the Joint Center for Housing Studies will release its latest biennial report on the remodeling industry, Improving America’s Housing: Emerging Trends in the Remodeling Market. Almost fully recovered from the recent downturn, the report identifies the remodeling industry segments that will support further growth in the years ahead. Please join us for the live webcast release at 12:00 p.m. Eastern.